Perhaps the most important thing that must be done when you are ready to begin planning your wedding is to first create your wedding budget. Your budget is important because it is almost impossible to know what you can afford for each aspect of the wedding if you don’t give yourself a limit to the overall spending costs. For most people, creating the wedding budget is the hardest job to do because you want to have the nicest and most memorable wedding that you can afford. The days when the wedding is paid for by the parents of the bride are practically gone now. Parents will often contribute to the wedding cost as a gift to the couple, but it rather rare for parents to cover the whole cost of the wedding these days. Usually it is because the parents simply can’t afford it, but couples today often prefer to pay for their own weddings because it ensures that they can do it the way that they want to without interference. A lot of the time, parents will forego paying for the wedding and pay for the honeymoon instead. Basically this makes creating your own wedding budget very important; especially if you are paying for both the wedding and the honeymoon yourself. These days, 4 out of 5 couples pay for their own wedding and it helps to know the wedding budget breakdown. 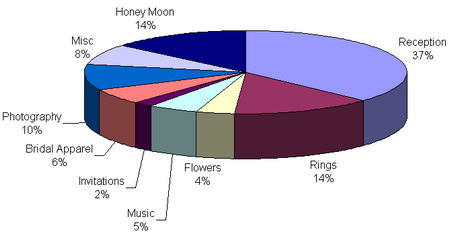 The chart below should help to give you an idea of the wedding budget percentages involved. This chart is a general breakdown of the costs and how much of your budget should be applied to what. As with the above chart, when creating your actual wedding budget, you should use the chart information as a guided starting point. From this chart, you will next have to create your actual dollar budgeted amount. When creating your budget, you will first begin with the overall amount that you can afford to spend. The average wedding today costs approximately $19,000. This is not a definite, but this is what the figures currently show. Now you will need to take that starting amount and apply it to an actual separate dollar amount. Use our Wedding Budget Planner and Calculator Spread Sheet to help you. With the Wedding Budget Planner and Calculator Spread Sheet all that you have to do is give it the individual amounts and then it will calculate for you how much money that you will have to spend on each aspect of your wedding, with a total overall cost for the wedding. The Wedding Budget Spread Sheet will show you is what needs to be done in order to fulfill your wedding hopes. It is with the budget that you can set realistic goals for your wedding and whether or not if your budget is realistic to your finances. If it isn’t, you will have to change or get rid of something. It’s that simple. 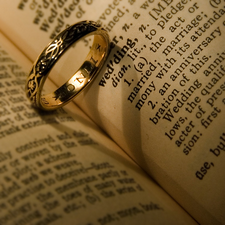 Once you have decided what you want to include and what you can afford, it is on to the wedding planning stage.